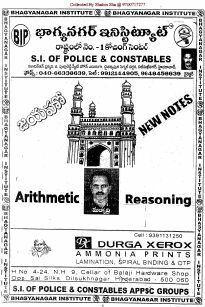 Arithmetic Reasoning Book Is Prepared by Malyadri. Arithmetic: You can expect to face questions on basic arithmetic like addition, subtraction, division and multiplication. Percentages: Questions on percentages will usually involve how to calculate cost price, sale price, discount etc. Ratio and proportion: Ratio and proportion related questions are solved using simple formulas. Questions on interest: Expect questions on simple and compound interest. You will need to utilize various formulas learned during your high school years. Numbers: Knowledge of whole numbers, fractions, decimals, real numbers and imaginary numbers is an important part of this subtest. Click Here To Download...Arithmetic Reasoning Test Papers Chapter wise. Nice material sir . I want to take current affairs (telugu) year book . Is there any chance to take year book?